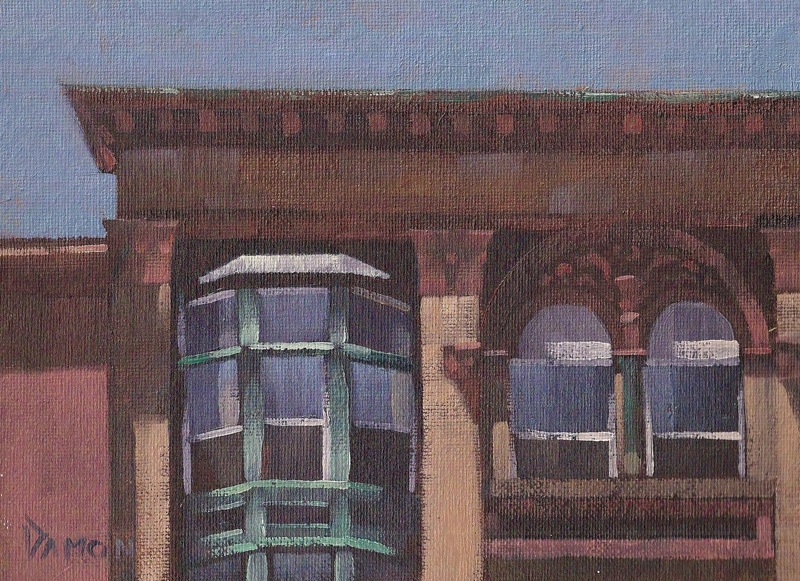 I am constantly drawn to architecture for subject matter to paint. Not merely for the fact that I find architecture interesting, but also because they make for great studies in perspective, value,composition, and virtually every element that goes into what I think makes a good painting. 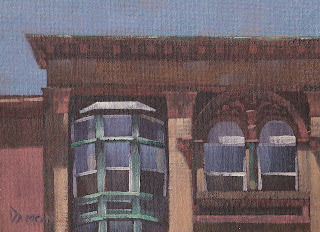 When I choose a building to paint, it's not necessarily because it holds some particular sentimental value to me, rather it is because I see all of the elements aforementioned above coming together harmoniously in good balance. It could be the dark shadows being cast in contrast to bright sunlit areas causing intense drama in the scene, or the wide range of values created by the same sunlight as well as different tones and shades of color. It could also be a good contrast of complimentary colors that draws my eye. All of these elements are important in the making of good artwork, but of course there are many others as well. By focusing on one area of the building, the composition takes on a quality that is almost abstract in the first stages of the painting process, which gives me a better understanding of how shapes and lines relate to one another. It's only by placing the right values in the right places that the painting then starts to take on some depth , giving the appearance of a third dimension. So these are but a few examples of why buildings make for great subject matter. In the end, one of the main purposes of my painting them is to gain greater insight, and knowledge of art. You are very talented, Pete! I love the Cape area, enjoy seeeing your paintings of familiar scenes.